Carnegie Medal? Tick. Booktrust Award? Tick. Costa Prize? Yup: that too. War, power, mind-control: this is getting silly. Just read it, hey? 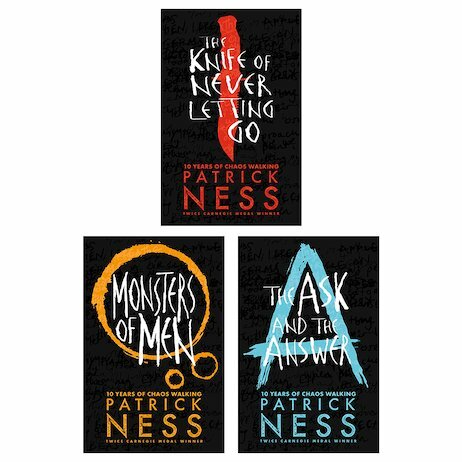 Patrick Ness’s epic saga is like watching a frontline newsreel from a brutal future war. Blistering power: it feels as raw as salt scrubbed into your skin. Imagine: a New World of men. A virus that forces all those men to hear each other’s thoughts. A terrible secret they’ll do anything to hide… When a boy – the last boy – learns he has been lied to. When a convoy arrives from another planet. That’s when all-out war will tear the world apart. This pack contains mature themes. 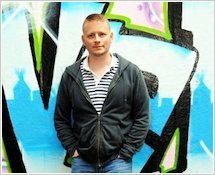 Bestselling and award-winning novelist Patrick Ness was born in Virginia, USA, and spent his upbringing in the states of Hawaii, Washington and California. He has lived in London since 1999. He is the author of a novel and short story collection for adults, but is best known for the Chaos Walking trilogy: The Knife of Never Letting Go, The Ask and the Answer and Monsters of Men. The trilogy has won the Guardian Children’s Fiction Prize, the Costa Children’s Book of the Year Prize, and the Booktrust Teenage Prize. In 2011 Monsters of Men won the prestigious Carnegie Medal after all three books in the trilogy were shortlisted, the first time that has ever happened. A Monster Calls is Patrick’s sixth book, created from the final idea of 2009 Carnegie Medal winner Siobhan Dowd, whose early death from cancer prevented her from writing it herself. In 2012 it became the first book ever to win both the Carnegie Medal and Kate Greenaway Award in the same year.